Powers/Abilities: The Vodū all possess certain superhuman physical attributes. They are true immortals who cease to age upon reaching adulthood, and they cannot die by conventional means. The Vodū are immune to all terrestrial diseases and are resistant to conventional injury. If a Vodū is wounded, his or her godly life force will enable him or her to recover at a superhuman rate. It would take an injury of such magnitude that it incinerates a Vodū or disperses a major portion of his or her bodily molecules to cause him or her to die. Even then, it may be possible for a god of greater or equal power, or several gods acting together, to revive the deceased god before the god's life essence is beyond resurrection. Vodū flesh and bone are about two-and-a-half times denser than similar human tissue, contributing to the gods' superhuman strength and weight. An average male god can lift about 25 tons; an average goddess can lift about 20 tons. The gods' metabolism gives them superhuman endurance in all physical activities. Many Vodū also possess additional superhuman powers. For instance, Eleggua, the god of communication, understands all languages and can cause acute confusion in and alter the communication abilities of others. In addition, the Vodū are served by the loa, lesser elemental spirits who possess more limited, specialized gifts that personify forces of nature. In rare instances, mortals may ascend to loa status after death if they were honored in life. The twins Legba and Eschu, two of the Vodū pantheon's younger members, supervise the loa and are often the first Vodū invoked by humans when they wish to call upon the loa or other Vodū for assistance. History: (Thor & Hercules: Encyclopedia Mythologica) - The Vodū (also known as the "Orishas" or West African gods) are a race of superhumanly powerful humanoid beings first worshipped by the Fon people of Dahomey (in the modern-day nation of Benin) and the Yoruba people of the Niger River valley (in the modern-day nation of Nigeria) as early as the 12th century. Most of the Vodū dwell in the Orun, the Great Beyond, a small "pocket" dimension adjacent to Earth; several interdimensional nexuses between Orun and Earth exist throughout the African continent, including one near the ancient Yoruban city of Ife (located in modern-day Osun State, Nigeria). Very little is known about Orun other than it appears to be built upon a small planetary object. The Vodū are called different names by their human worshippers; for example, the Vodū Sky Father Buluku is known as "Olorun" by the Yorubans, as "Nyame" by the Ashanti, as "Ndriananahary" to the Malagasyspeaking people of Madagascar, and as "Olodumare" by practitioners of Cuban Santeria. To the Baganda of the African Great Lakes region, Buluku was known as "Mukasa" and sired their war god, Kibuka. To the Baoulé of West Africa, he was known as "Alouroua" and fathered Ghekre, who would later be worshipped as the "Gorilla God" by the White Gorilla Cult of Wakanda's Jabari tribe. In recent centuries, the Vodū's mortal followers incorporated aspects of Christianity into their worship of Buluku and his offspring. Today, these worshippers are concentrated in Western Africa, the Caribbean (particularly Haiti and Cuba), and Central America. Through ritualistic propitiation and invocations directed toward a particular Vodū or loa, mortals can tap their patron god's power. Sometimes, the Vodū even go as far as possessing mortals who invoke their names, temporarily taking over the mortal worshipper's conscious personality. The Vodū's precise origin, like that of all Earth's pantheons, is shrouded in legend. According to ancient myths, Buluku, the supreme all-father of the Vodū, merged with the primordial Earth Mother Gaea (later known among the Vodū alternatively as "Nana," "Ale," and "Asase Ya"), and sired twin offspring: The sun god Lusa and the moon goddess Mahu. As a result of this merging, the "supreme creator" was sometimes worshipped by mortals as the androgynous "Nana Buluku." Vodū worshippers believe that Lusa and Mahu joined forces to create the mortal world, mortal life, and mortal technology in four days' time. Buluku remained in Orun, content to leave this newborn mortal world's care to his children. Lusa and Mahu, in turn, sired several divine pairs of twins, including Avlekete and Ezili, Ogun and Shango, Dam-Ayido Wede and Sagbata, and Eschu and Legba. Lusa, Mahu, and their family became directly active in mortal affairs and descended to the ancient city of Ife, the legendary first city of the Yoruba people. Eventually, their twins, who each possessed a unique aspect of Buluku's omnipotence, strayed from Ife and settled in other mortal cities in Western Africa. (Thor I#300 (fb))- Centuries ago, Buluku, the leader of the African Gods attended a council of Godheads in which they agreed not to interfere with the activities of the Celestials. (Thor & Hercules: Encyclopedia Mythologica) - When many of their worshippers were forcibly relocated to the Caribbean islands as slaves in the 16th century AD, Dam- Ayido Wede, the Vodūn god of serpents, followed the slave ships across the Atlantic Ocean and brought Vodū worship to the New World. (Doctor Strange III#17/2, 20/2)- The connection of the African gods to Voodoo was revealed from the Book of the Vishanti, as the creation of the first Brother Voodoo was depicted when Sagbata allied with Chthon to create zombies. (Thor I#301)- Thor visited Ala, where he successfully petitioned Buluku for a portion of the life energies to revive the Asgardians, slain in battle with the Celestials. (Thor Annual#10) - Shango helped Thor defeat the entity Demogorge. Briefly consumed by the creature, he was freed when it rejected Thor. (Thor I#398) - Two African Gods, Buluku and another, possibly Nyambe and Anansi, sensed the Enchantress' grief as she raged over the apparent death of Heimdall. (Daredevil: Father#1-5) - Cuban-American entertainment entrepreneur Nestor "NeRo" Rodriguez consulted a Santerian priest ("santero") and invoked Eschu to empower him so that he could avenge his father, who had been murdered by the Kingpin (Wilson Fisk) years earlier. Eschu answered Rodriguez's call and granted him superhuman abilities. Calling himself "Eleggua" in honor of his patron deity, Rodriguez used his family's fortune to bankroll the Santerians, a street-level vigilante team operating out of New York City and comprised of his childhood friends, who were similarly empowered by Ezili, Ogun, Oya, and Shango. Comments: Adapted to the Marvel Universe by Mark Gruenwald, Ralph Macchio, and Keith Pollard. Nyambe had more significance over Shango or his father Lusa. Anansi is a spider-god of wisdom who acted as vizier to his father, Nyambe. My book on African spirits places a lot of importance on Nyambe as ruler, judge and Great Spirit. Lusa is mentioned only as the sun-god who fathered the Great Twins of which Shango and Damballah are two of. In the MU, I would surmise that Buluku supersedes them both to keep dissension out of the Loa (Voodoo Gods) and their relations the Orishas (Sky Gods). In an alternate reality, (Earth-Thor-Thrall of Seth, @ What If II#38), Buluku met with the godheads to discuss Seth who has conquered Asgard in this reality. In the Marvel Universe, the Black Panther and a large portion of the people of Wakanda worship the Panther God. 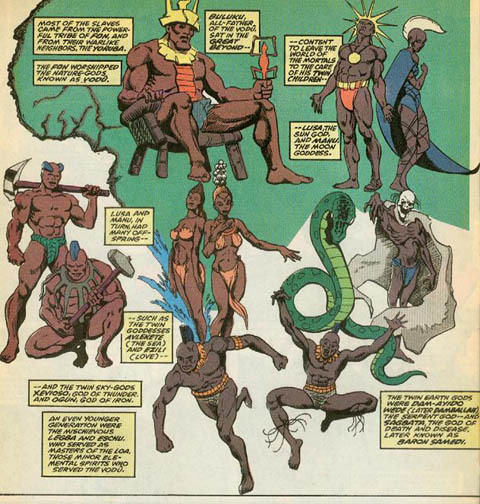 While there is no "Panther God" in the African pantheon, Christopher Priest, the ALWAYS ENTERTAINING writer of the Black Panther, named the Panther God as Bast. Bast is an Egyptian Cat God, but I see no reason why the worship of this deity couldn't have migrated South slightly to take hold in Wakanda. So, we're going with naming Bast as the Panther God, and including him/her (Androgyny is not that uncommon in mythology) with the Egyptian Gods, for now. To which Snood replies: "It's name was Damballah at least as far back as 10000 BC, which is earlier than I might expect the African Gods to have been around. Perhaps the African Damballah stole the Set-spawn's thunder, much the way Seth did to Set." Carycomix replies that "If so, then Set's kid may have had another name. Perhaps, the Stygian equivalent of Apophis? According to the STARGATE: SG-1 website, the symbol for the actual Apophis of Egyptian mythology was a snake!" The main image in this profile is by Pablo Raimondi. Profile by William Uchtman and Snood. Damballah spawn of Set, impersonated/confused with the Voodoo God @ Silver Surfer Annual 2/7(fb-born), Doctor Strange II #48. Avlekete [center left], goddess of the sea, is the daughter of Lusa and Mahu. She is also wife to the sea-god Olokun. She supported Legba in giving power of the loa to a mortal as a force of good against the evil unleashed by their brother Sagbata. Ezili [center right], goddess of love and fertility, is the daughter of Lusa and Mahu. She supported Legba in giving power of the loa to a mortal as a force of good against the evil unleashed by their brother Sagbata. Legba [bottom left], the god of travelers and messengers, is the son of Lusa and Mahu. He was also master of the loa and his duties involved escorted mortal souls to a peaceful afterlife after physical death. After Sagbata involved Chthon in a spell to create zombies, he joined forces with the other gods of the Vodū to create a force for good against the evil unleashed by his brother. He gave the mortal Laureant power over the loa by means of an ultimate spell he obtained from the earth mother, Gaea. Laureant then became the original Brother Voodoo, the first mortal lord of the loa. Lusa [top left], the sun god, is ruler of the Vodū. He is father of the gods Ayaba, Damballah, Eschu, Faa, Gou, Legba, Loco, Maou, Ogun, Sagbata, Shango and Zaca. Mahu [top right], the moon goddess, is wife of Lusa and mother of the gods Ayaba, Damballah, Eschu, Faa, Gou, Legba, Loco, Maou, Ogun, Sagbata, Shango and Zaca. Ogun [middle, near right], the god of iron and artisans, is the son of Lusa and Mahu. He supported Legba in giving power of the loa to a mortal as a force of good against the evil unleashed by their brother Sagbata. Sagbata [middle, far right], also known as Baron Samedi, is the god of death and plague. He conspired with the Elder God Chthon to create a spell for the witch doctor, Schango, to create zombies for the pirate Boute-Fe.